David and I have been married for just over three weeks, and our vows have already been put to the test. Nah, not the fidelity part. Not even that bit about asset variance. 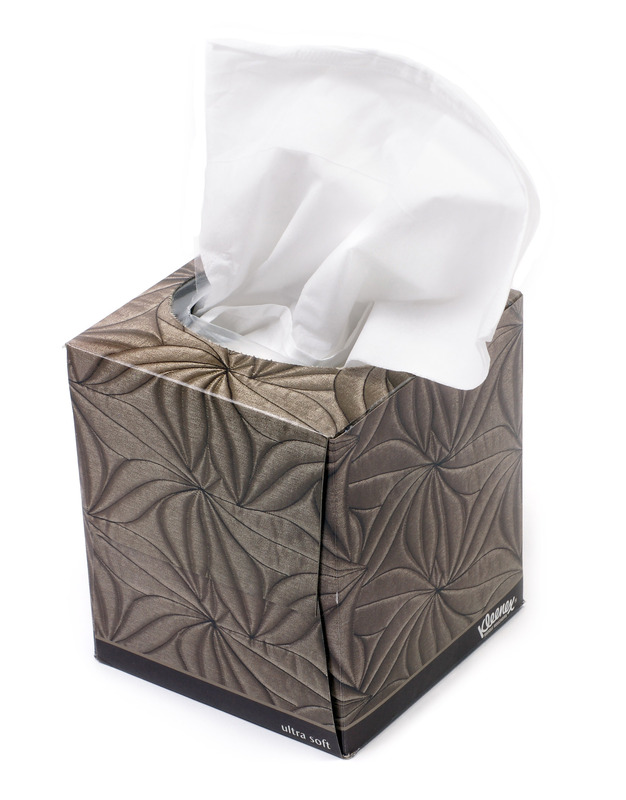 Our fledgling union, alas, has floundered for the first time upon the rocks of the Common Cold. Once I got the news David was home, succumbed to the upper respiratory funk spreading about town, I sped straight from work to his bedside, armed with Theraflu, gingerale and the noble intentions of the newly wed. I found him propped up in bed, dosing Mucinex, downing a batch of chicken soup he made himself and adjusting the lineup of his Netflix queue. He rejected my Theraflu “poison,” waved away the gingerale and informed me that he preferred to be left ALONE, to wallow in his sickness to heal on his own agenda. He had a game plan in place and was invoking historical self-reliance. Yes, that’s right. Alone, as in without me. ::sniff:: That’s fine, then. After assuring myself he wasn’t actually anywhere near death, just inflicted with a mild case of grumpies, I went back to my condo for a “chillin’ with the cats” kinda weekend. Passing the grocery store, I had a sudden inspiration! Soup! I’ll make soup! I know, what a devoted, even heroic thing to do – to sacrifice my wounded sensibility to make my cranky husband a bowl of homemade soup to speed his recovery, even though he had rejected my Nightingale-esque efforts. Yes, that would be pretty awesome, wouldn’t it? That is, if I were actually making it for David, and more notably, if David actually liked soup. Truth is, he hates soup. Well, all soup but for his bachelor chicken man-soup. 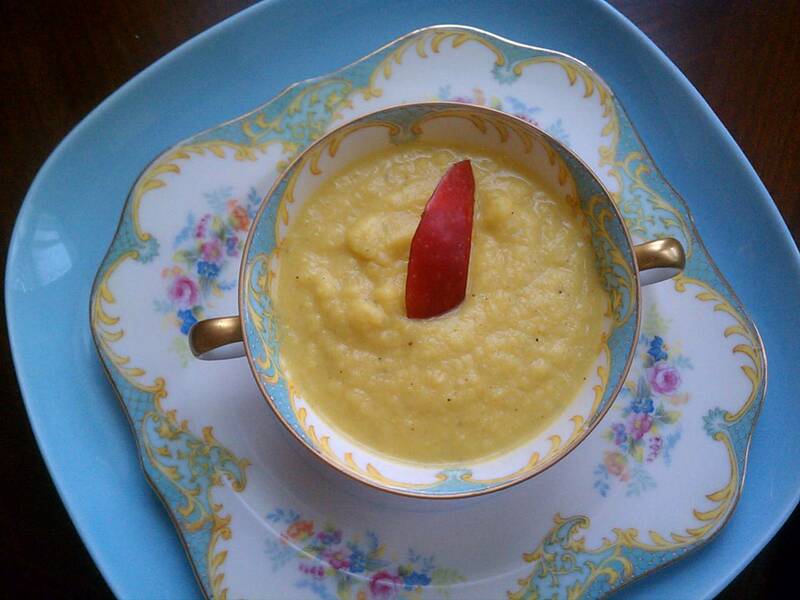 Oh, and that white bean and ham chowder our friend Randall made for Soup Swap last year. I, however, do like soup and do like it quite a bit. Released to my own recognizance, I defiantly set to researching a soup recipe purely for personal enjoyment. Feeling just a tad scorned, I sought a soup chock full of nourishing, flu-fighting nutrients (that had David the option of partaking of it, assuredly would have restored him immediately) and yet a soup I knew David would loathe to the very fiber of its fiber, and never once let pass his lips, a soup he would hate on principles far beyond soupiness. 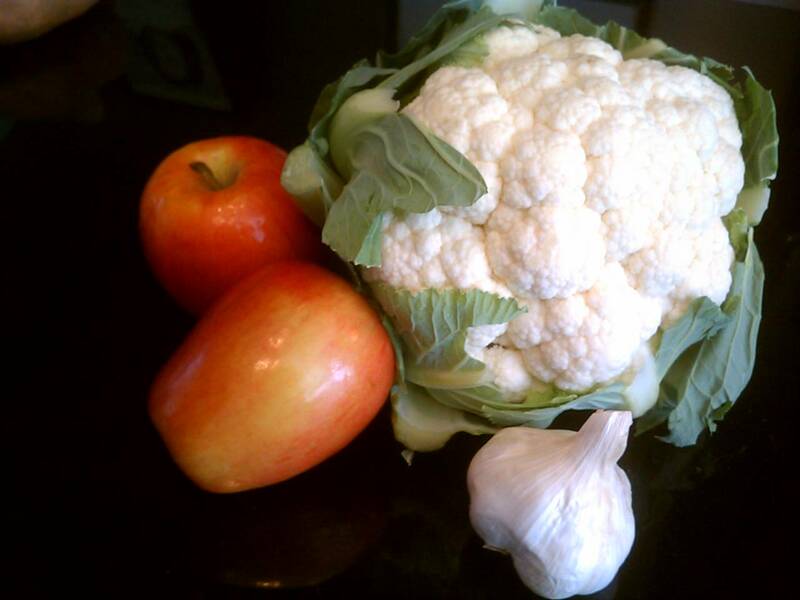 Cooked, cruciferous vegetables! Ha! Brightly colored tree fruits, mixed with cooked vegetables! Ha! Ha! Turmeric, garam masala and all those stinky Indian spices that are really good for you! Mwah, ha ha! 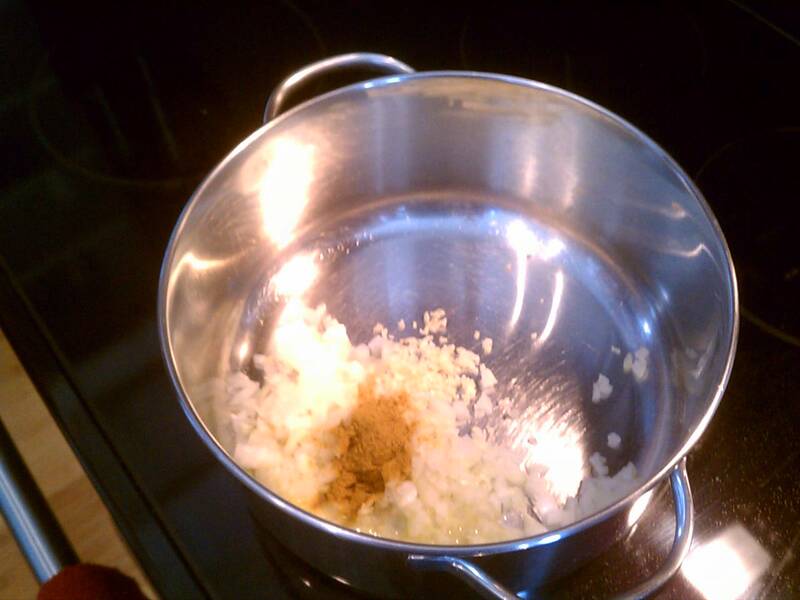 In a 3 1/2- to 4-quart saucepan cook onion, garlic, and curry powder in butter over low heat, stirring for several minutes until the onion is softened. 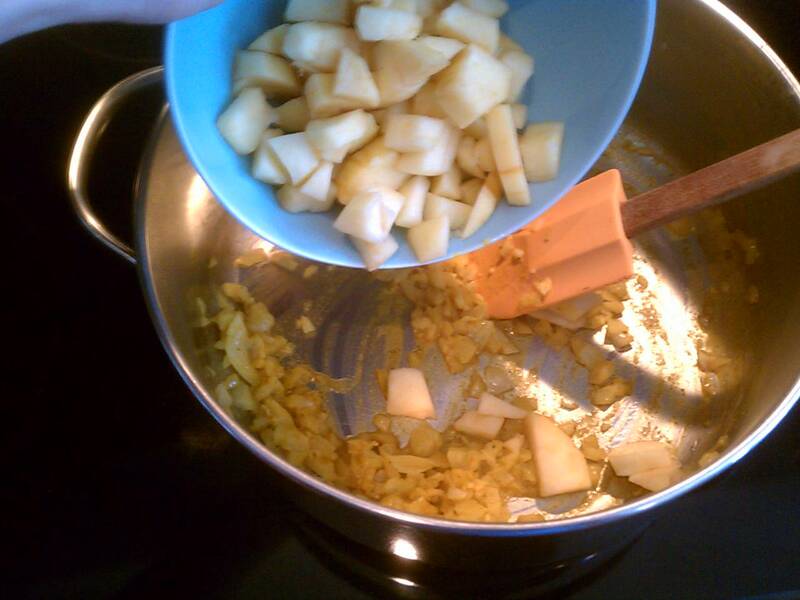 Add apples and ginger. Stir another minute. Add cauliflower and chicken broth. 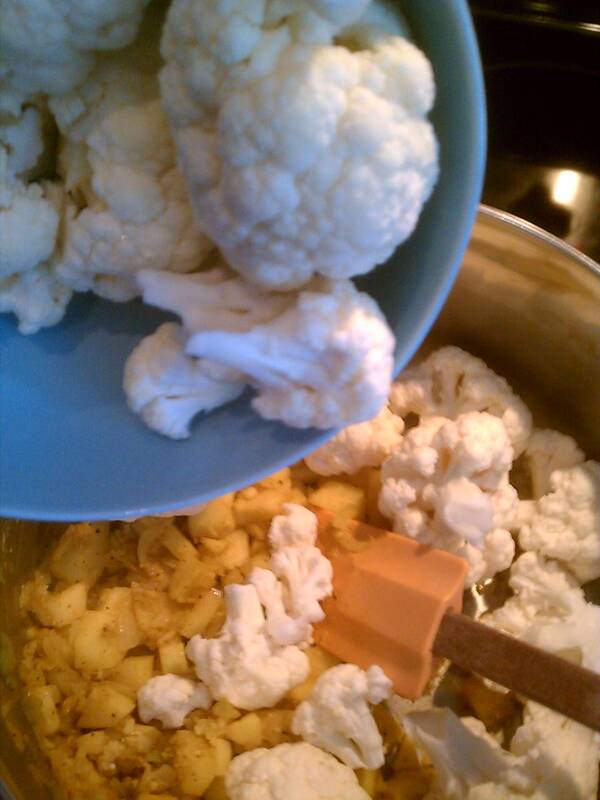 Cover pot and simmer until cauliflower is very tender about 20 minutes. Purée soup in batches in a blender (or food processor) until very smooth. (Word of advice, cover blender top with a kitchen towel to catch any molten soup exploding through blender lid!) Return pureed soup back to pan and reheat, adding half and half, salt, black pepper and cayenne to taste. Serve with a sense of accomplishment and a side of nyah, nyah, nyah, you sickie! I snagged some of the apple I had diced for the soup, added a bit of cut up Bosc pear, freshly ground ginger, cardamom and black peppercorns to the bottom of a tall glass. 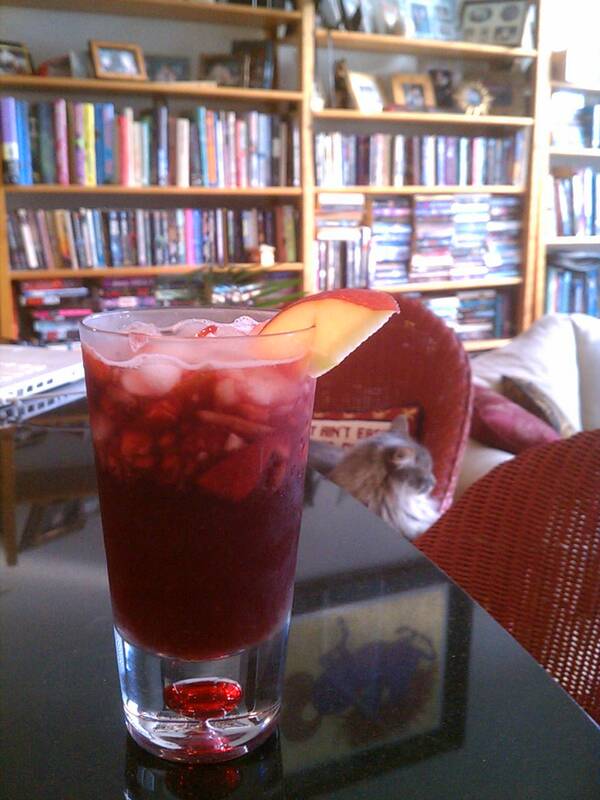 I muddled this with a dash of agave syrup, then topped it with ice, a few ounces of red wine and a splash of gingerale. Truly restorative. This entry was posted in Cooking, Relationships, Wedded Life. Bookmark the permalink. Sorry to know David isn’t feeling well. Sounds like missed out some good food and better cocktails. Hang in there Kim. He’s perfectly harmless in every way. Girl! You’re truly getting the hang of this marriage thing! Only for me, a little curry goes a long way.